CSV import isn‘t only for importing plain data. You can also add files and images to the zip you’re going to import. 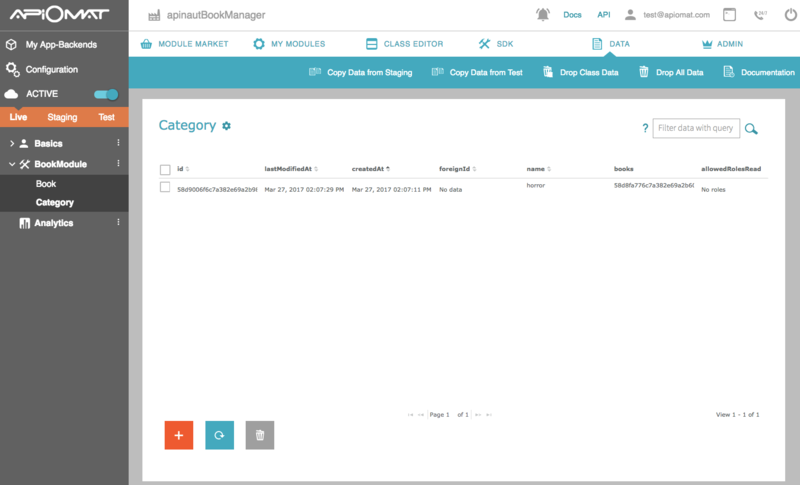 Let’s say you've created a backend which contains the BookModule with the Book class. Next to the default attributes createdAt,lastModifiedAt and foreignId you added the attributes cover of the type Image and summary of the type File. Another class "Category" has an Attribute "name" of the type String and a Collection of the Class "Book" with the name "books" . Add the CSV Module and deploy your Backend. Add four columns to the csv file: id, foreignId,cover and summary. Leave the id row empty, because that’s the ID generated by ApiOmat for each object of a class. But still, we want a unique identifier for every object. That’s what the foreignId is for. Insert a value of your choice in that column. If you want, create more objects of the class book. Id, foreignId, books and name. Now pack the CSV files and the folder to a ZIP-file. Go to the Dashboard and choose the CSV Im/-Export Tool from the tools tab. Click on „Select import file“. Choose th ZIP file you created and hit „OK“. That’s it. If you look at the Data-tab you will recognize that every object has an id. Now we want to create some data within the dashboard and export it afterwards. Go to the Data-tab and drop all data you imported. Now choose the “Book” class on the left side of the screen. Now add a new set of data by clicking on the “+” in the upper right corner. You can edit at least all the attributes which you gave to the class. Then upload a cover and name your book. Next, change to the “Category” class and add an object. Change the name of the category to a name of your choice. Add the book you created before as a reference. Now Export your data by switching to the “My Modules” tab and choose “Export Data”. Unpack the downloaded .zip-file. You will get three csv files and a folder with the name of your backend which contains all images. Open the Bookstore$Book.csv file. Now open the Bookstore$Category. Once again, delete the id and change the name. Don’t forget to save! Pack the edited CSV files and the folder to a new ZIP file. Go to the Dashboard and import the csv file you just created. You will get a report how many data sets have been added. To see that everything went as expected, change to the Data-tab. The data you imported should have been added to the ones you exported before.